The folks at Kelley Blue Book have only good things to say about the 2017 Honda Civic, and West Michigan drivers are taking notice of their praise! In addition to being named the Best Buy of 2017 in the small car segment,* the Honda Civic EX with Honda Sensing has just been recognized as the 2017 Best Auto Tech Value. * Drivers are no doubt wondering what makes the Honda Civic so special, but with its incredible value, top-notch safety, and cutting-edge features, we think it’s well worthy of its accolades. Safety is key in this year’s Civic. This sedan’s extensive list of safety features includes all of the features that West Michigan drivers expect from Honda cars, including Vehicle Stability Assist, Brake Assist, Advanced Compatibility Engineering (ACE) body structure, and more! Moreover, the Civic EX contains a significant number of less-common features, such as automatic headlight control and an electronic parking brake with an auto-hold feature. And then there’s the remarkable Honda Sensing safety suite, which uses the power of the Civic’s onboard computers to help the driver stay in control on the road. The Honda Sensing package contains Adaptive Cruise Control with Low-Speed Follow, Lane Keeping Assist, Road Departure Mitigation, and Collision Mitigation Braking—amenities that used to be confined to high-end luxury models. 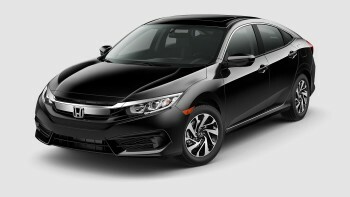 Although Honda Sensing only comes standard on the Civic Touring model, it’s available on all trim levels for a very modest price. Take the Honda Civic EX for a Test Drive! There’s still so much we could say about the technologies that have made the 2017 Honda Civic a clear favorite of West Michigan drivers, but the best way to learn more is to schedule a test drive at one of our easy-to-reach West Michigan Honda Dealer locations! We’ve got tons of current offers and finance options, and that means it’s easier than ever for drivers to drive home their new Honda today.